I've got a quick post for you today with another way to use the white bean dip that I posted last time. 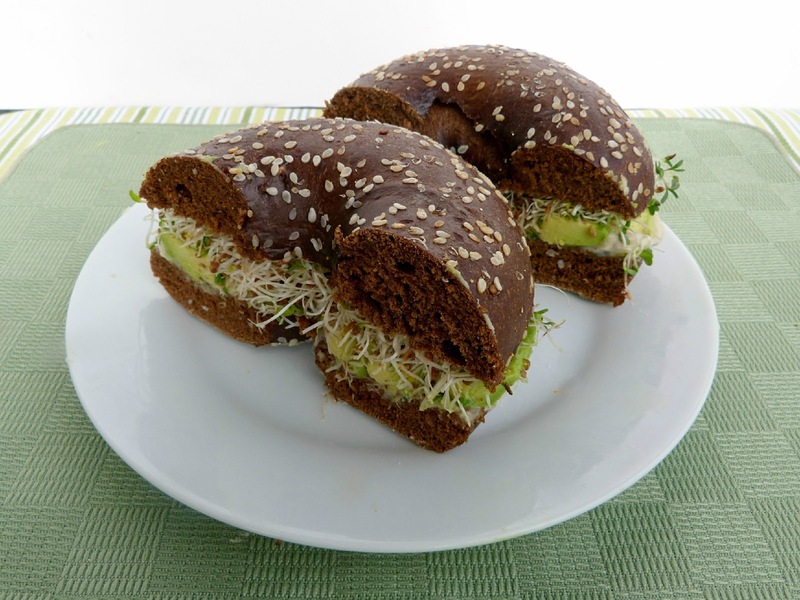 Actually, the real reason I made that dip was so that I could make my favourite sandwich - pumpernickel with white beans, sliced avocado and alfalfa sprouts! The inspiration for this sandwich came from The Way the Cookie Crumbles, and each time I eat it I wonder why I don't make it more often! I love the combination of the creamy white beans with the avocado slices, and the sprouts help provide some texture and lots of nutrition. Pumpernickel is one of my favourite types of bread, and when I saw some freshly baked pumpernickel bagels for sale at the farmer's market recently, I had to get them! Regular sliced pumpernickel loaf or another type of whole-grain bread would also work well for this sandwich, but I really liked this bagel version, since it was a bit sturdier than bread. This was a healthy and filling lunch - for me, it's the kind where you enjoy every bite and, like a good book, you actually don't want to finish it because you don't want it to end! *I didn't measure quantities for the sprouts and white bean dip - just use however much you like! Cut the bagel in half. Spread a thick layer of white bean dip on the bottom half (I also added a thin layer to the top half to help the sprouts stick). 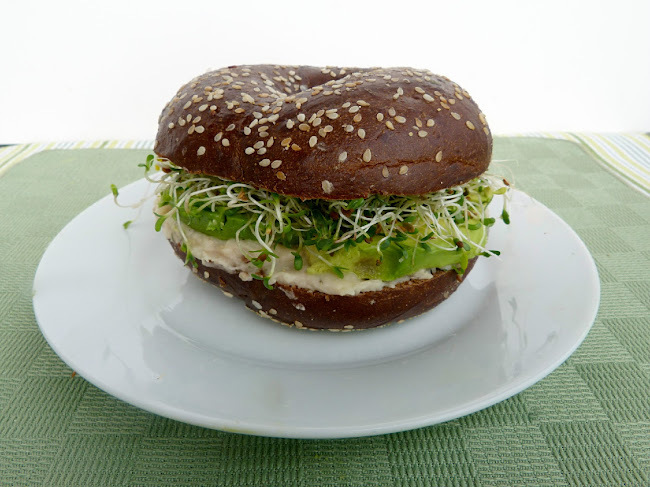 Next, add a layer of avocado slices, topped with alfafa sprouts. Aw, I would miss it too! I should learn more about gluten-free baking so nobody feels left out by my posts...in the meantime, (which could be awhile haha) at least you can still enjoy the sandwich filling! I would love this combo! I just found your blog from your sisters blog. You both have great content! wow. I looks so delicious !! I have to try this. Love the colors of the pumpernickel bread with the greens !! Thank you! Yes, this was a rather photogenic sandwich! I'm not supposed to eat gluten, but pumpernickel is the one bread I cannot resist. We went to NYC over the winter holiday and I gorged myself on pumpernickel bagels - I was the happiest person alive. Until 2 hours later when the stomach pains started to kick in. I hope if you try it, it's worth the stomach pains! Is it possible to make a gluten-free pumpernickel bread (or at least one that's similar in taste)? From yours and Caitlin's comments, it seems like it would be popular! What a nice sandwich, I should try the dip. Looks delicious. Thank you! It also goes well with sliced cucumber if you don't have avocado. Thanks! It did have most of the things I look for in a lunch - quick (as long as you have the dip made ahead of time), healthy and filled me up for a long time! I love sprouts too but I find it hard to think of ways to use them other than in sandwiches and pitas. This makes me miss my favorite bagel place back in Wisconsin--they had some really great vegetarian sandwiches! I love putting hummus on bagels instead of cream cheese, so putting your white bean dip on this sandwich sounds good to me! I love bagel sandwiches, but I always make them too thick for my mouth! Thanks Janet! The wrap is a good idea too, I should try that! Thanks for the comment - so glad you liked it! Grilled avocado does sound delicious!